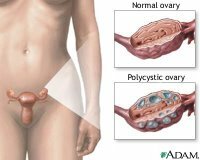 I had a transvaginal ultrasound yesterday and it revealed, as I expected, that I have PCOS (Polycystic Ovarian Syndrome). Good news is the doctor assured me that there will be no need for surgery since the size of my cysts are still below a centimeter. I wouldn't want to have another D&C (raspa), oh please! The bad news, however, is that our plans for baby number 2 will be impossible for now (at least not forever). What is PCOS or Stein-Leventhal syndrome? Basically, the condition is characterized by irregular menstrual cycles or absent menses, multiple cysts on the ovaries, and infertility. My doctor told me that I am having a hormonal imbalance. Because of this hormonal imbalance, my egg cells do not mature and are not released from the ovaries. Since they are not released from the ovaries, I do not have my monthly menstrual period. The follicles where these undeveloped eggs are contained accumulate as cysts. Look at the picture below. I feel really bad seeing the results. I'll be on the pill again to regulate my cycle. That means plans for Baby No. 2 will be shelved until further notice. I'll be taking Diane for 6 months to one year. I'm scheduled for another ultrasound after 6 months. I need to regulate my blood sugar levels, too. That means I'll be on a low sugar diet from now on. 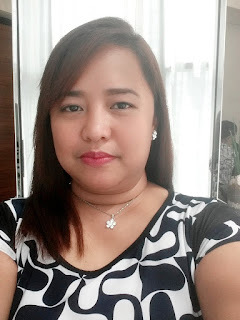 I read a blog of a woman who's suffering from secondary infertility because of PCOS. They are on their second year of trying to conceive Baby No. 2. We're been trying ever since Rap turned 3 years old. She posted a picture of her 3 year old son and wrote about this child being a "miracle". I feel the same way about Rap. He is really a miracle and a gift from God. Most people, even those close to us, think that Rap was an unplanned pregnancy. Well, he wasn't in a way. Daddy Jun wanted to have a family right away. He was already earning that time and felt that the next step in his life should be having a family. I was a fresh grad from college and was so in love. When we asked for Mama's permission for us to get married because I was already pregnant, she was furious. Papa did not talk to me for a month. I had to endure the pain of them hating me during my first trimester. I'm glad Daddyjun showered me all the love and care I needed during that time. Everything turned out fine eventually. Rap was well taken care of inside my tummy. I started having my regular pre-natal checkups since he was four weeks inside of me. Maybe that's why he's grown up to be a smart boy. When Rap came out, everybody adored him especially from my side of the family. He's the first apo of my parents. He's the first grandson bearing the Flores name. Six months after Rap was born, I started to bleed profusely and had a D&C or raspa. My doctor told me that I had polyps in my uterus and she had to scrape it out. After that, my cycles went haywire. I took pills for nearly 3 years to have a regular cycle. I stopped taking them during the time we were trying for Baby No. 2. Yesterday, I learned that I had to take pills again to have monthly menstrual cycles. Because if I don't, the cysts would require surgery. Rap wasn't unplanned after all. God planned everything. He gave me Rap at the right time, while my ovaries are still healthy to conceive a child. It is really a miracle that he was conceived after all.